2015 was a great year to be a U2 fan. In 2015 I reached a goal that I had set back in 2010, in during the 360 Tour. 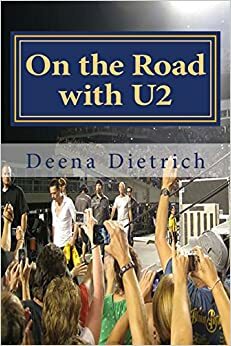 I published my U2 memoir On the Road with U2 – my musical journey – and people seemed to like it! Apparently people enjoyed reading about my adventures and travels to 75 U2 shows between 1992 and 2011. Not only did I publish my U2 memoir, but I was able to give it to Larry and now he has a copy – more than I could have ever hoped for! 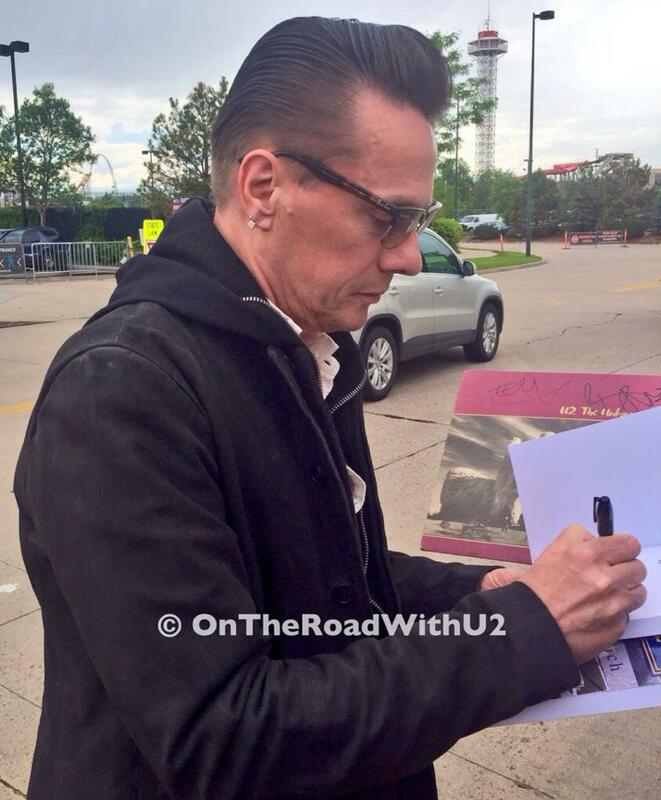 And many other U2 fans reached their goals as well by getting on stage, playing with the band, meeting the band. This iNNOCENCE + eXPERIENCE tour of 2015 truly was the Dreams Realized tour. 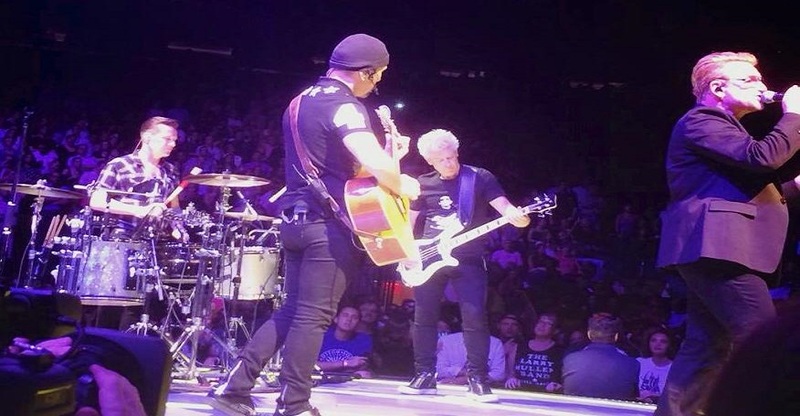 I saw 15 U2 shows from May 14 through July 31 in Vancouver, Denver, Chicago and New York City – including the Tour Opener and the North American Finale. Highlights for me at every show was “Invisible” and the e stage set, especially while standing at the rail of the e stage next to Larry while he was banging those drums. Also whenever U2 played “Volcano” was a highlight for me. Something about that song live, I dearly love! I heard the debut of “The Crystal Ballroom” in Chicago, which Bono dedicated to us fans who travel around following the tour. A treasured moment was hearing “October” for the first time ever in New York. It has always been one of my favorite songs and was amazing to finally hear it live. Another special moment was hearing “Two Hearts Beat as One” for the first time, also in New York. There were obviously many special moments for me throughout the summer, but my absolute favorite day of the iNNOCENCE + eXPERIENCE tour was June 6th in Denver. It was the day I gave my book to Larry. This was only the second time I had every met Larry – the first was 14 years prior on the the Elevation tour. We waited through a torrential downpour then Edge appeared out of nowhere and I got my picture taken with him – this was the first time I had my picture with Edge (I got his autograph on Elevation). There were only about 20 of us there. Within the next hour a many more people showed up and the line now extended the length of the street. Around 3:30ish another black suv pulled up and I noticed it was Larry’s bodyguard. I began to freak out and shake. Then Larry got out of the car and I almost started to hyperventilate. I knew I was about to achieve my goal I had for this tour. 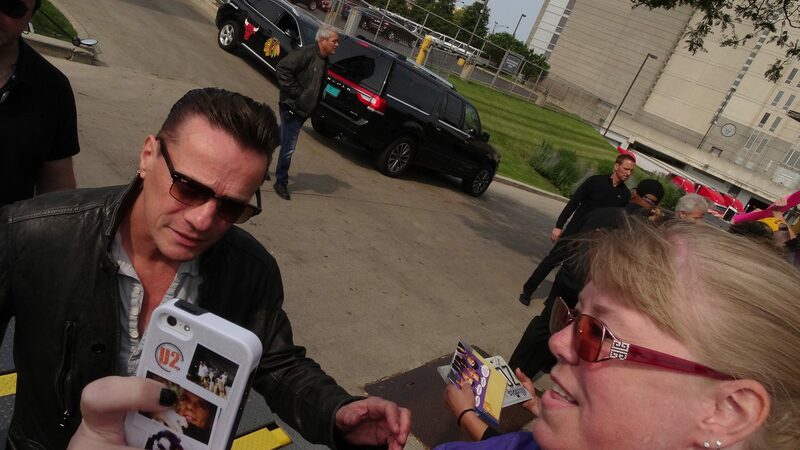 I had been planning in my mind what I would say to Larry this tour if I met him, and I was SO excited he stopped before Bono did so I could give Larry my book. I wanted U2 to have my book I wrote, but I really wanted to give it to Larry – Bono was my back up as I knew I would meet him. 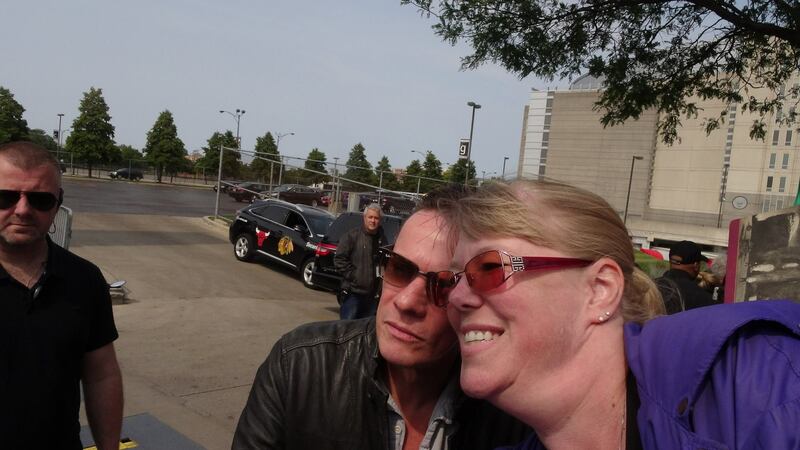 But since Larry didn’t come out to greet the fans at any of the US shows in 2011 on 360, I had no idea if I would get the chance to meet him – but I did! I don’t remember too much because I think I kind of blacked out. To the best of my recollection, this is what happened when I met Larry for only the second time. We were told Larry would not take pictures, but he would sign autographs. As Larry got closer and closer, I kept hearing Latha next to me telling me to breathe and it would be ok. Larry arrived in front of me and I immediately showed him my book and said something like, “This is a book I wrote about all the U2 shows I’ve been to over the years and I would like you and the guys to have a copy.” I’m not sure what his response was. 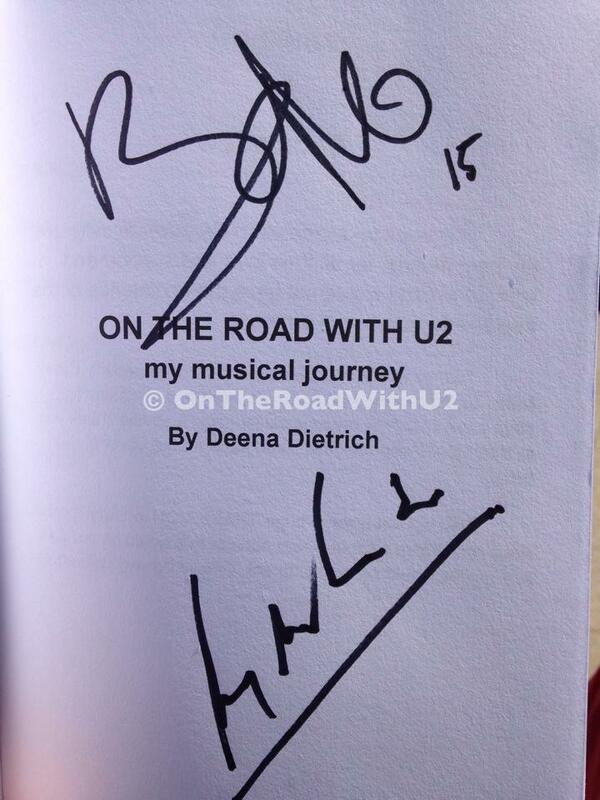 I autographed the copy I gave him. It read, “Larry, Bono, Edge and Adam, Thank you for the soundtrack to the my life. It’s All About Drums! 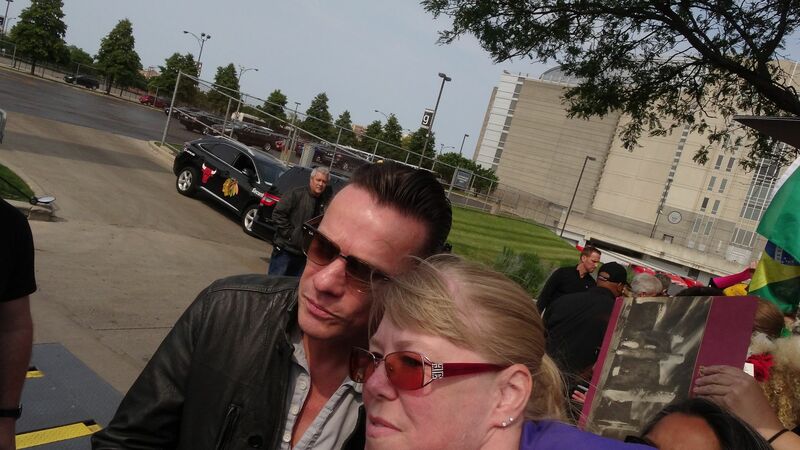 Deena Dietrich.” I then said to Larry, “Would you please sign a copy for me?” I think he said, “sure.” At some point during this interaction, I pointed to my “Larry Mullen Band” shirt and said something like “You remember me right? You know your my favorite?” – or some such nonsense. My friend Dahna captured this moment for me and Lori got a picture of Larry signing my book – and someone else posted a picture of Larry carrying my book as he walked down the line of fans. As Larry arrived at the end of the line, he started to take photos with everyone and some people from our side of the line ran down to get their picture with Larry, but I didn’t. I think I was still shock. I was just so happy Larry has a copy of my book I wrote, considering he was the inspiration for it. But then a bit of a panic set in – Larry actually has my book, Larry can actually read my book – all that gushing about him and trying to meet him over the years. Maybe about 15 minutes later, Bono arrived. 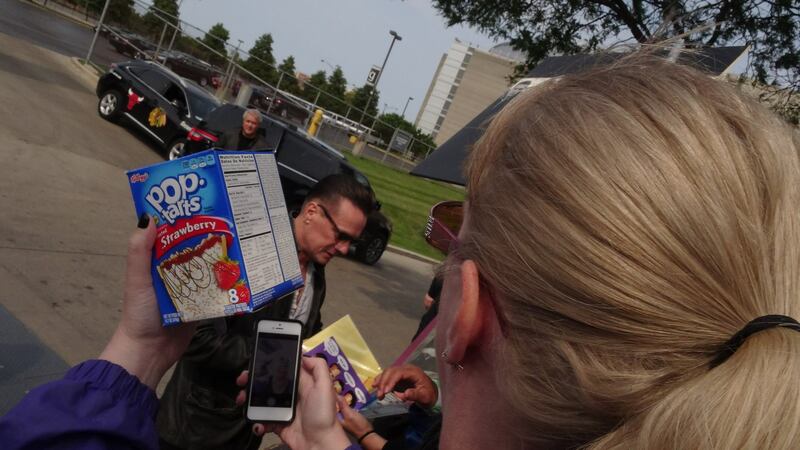 There were even more people now, and Bono started at the opposite end of the line where the people had just arrived. 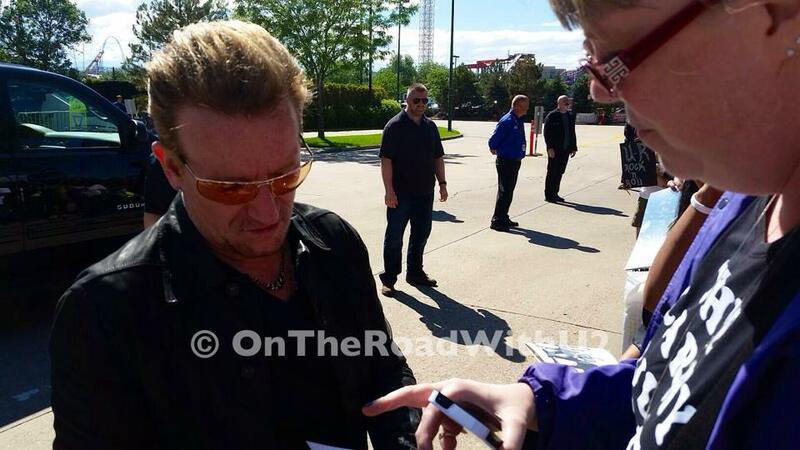 Unlike my encounter with Larry, I remember every detail of my time with Bono – because I am much calmer with Bono. 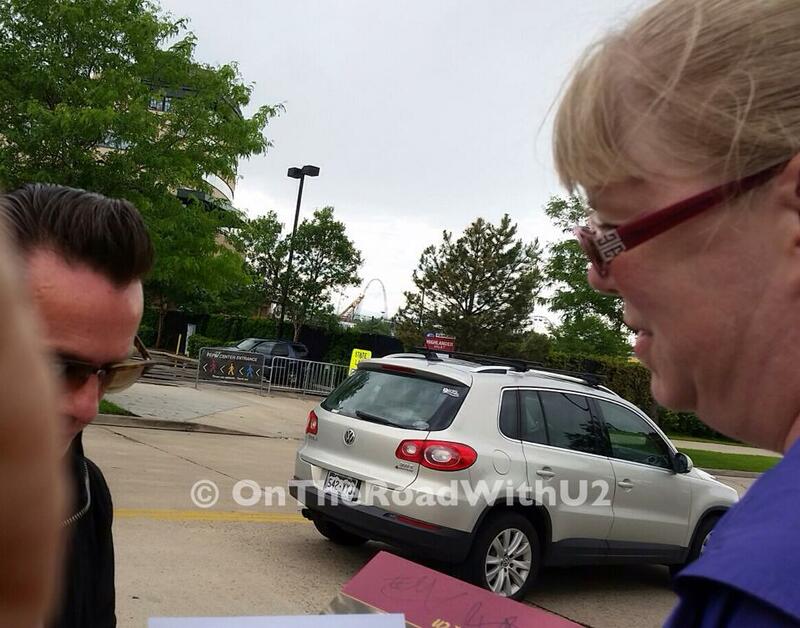 When Bono arrived in front of me I showed him my book and told him, “This is the book I wrote about all the U2 shows I’ve been to over the years.” And Bono said, “Really?” with an impressed, surprised sort of tone. 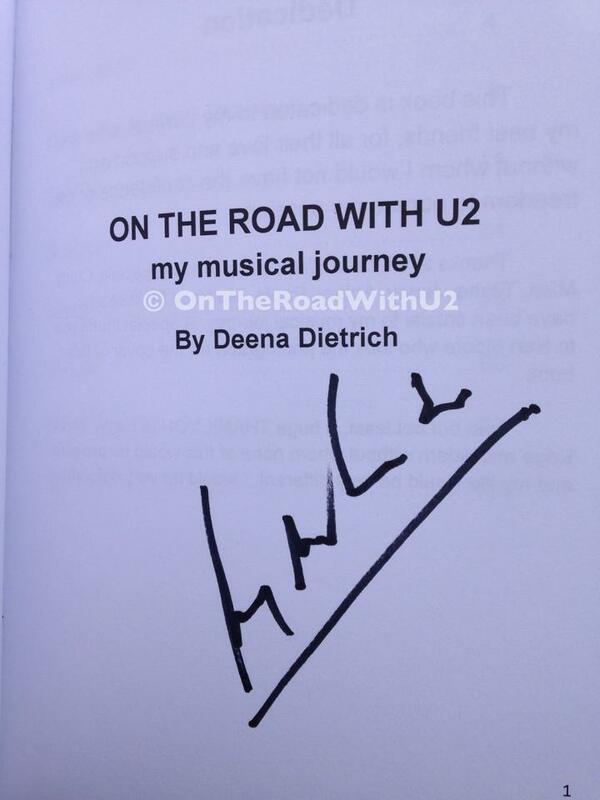 As he started to reach for it, I said, “I gave a copy to Larry because you know I like that cold stare.” Bono said, “I do too” and his eyes lit up and looked at me with a little smirk as if saying to himself, “This girl is quoting me to me.” And I was. 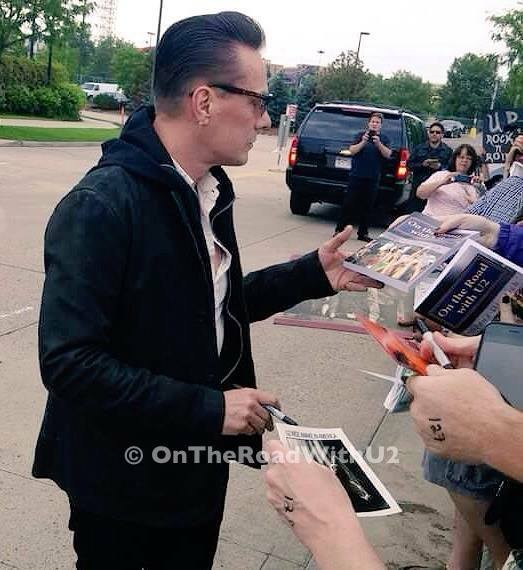 (I was referring to my conversation with Bono in 2011 on 360 in Seattle when I asked him if Larry was ever going to come out to greet the fans, and Bono said, “You like that cold stare don’t you?” After Bono autographed my book, I pointed to my “Larry Mullen Band” shirt and said, “You remember me … from Seattle?” Bono said, ” Oh YEAH I remember YOU!” I’m not sure if he did or was just playing along, but it was a great moment either way. 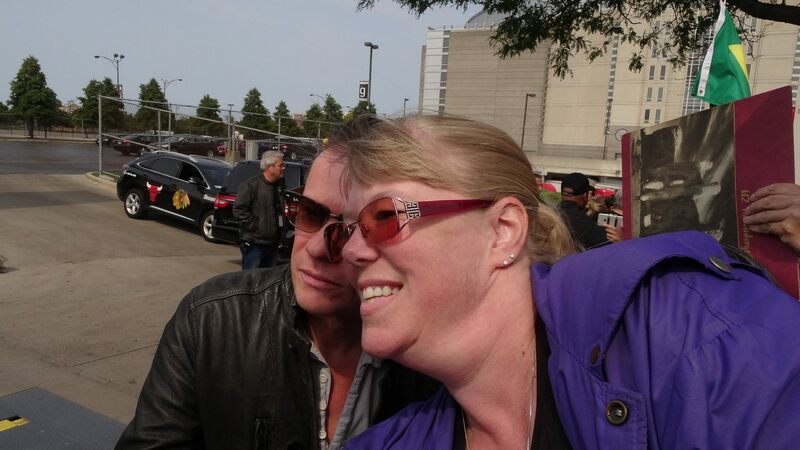 I then thanked Brian (Bono’s security guard) for Pittsburgh (Larry hugging me on his way to the stage on 360), and asked him if he remembered me. He said, “You’re welcome. Yes I remember.” Again, who knows if he did, but I’ve wanted to thank him for that magical moment because it was all due to Brian. 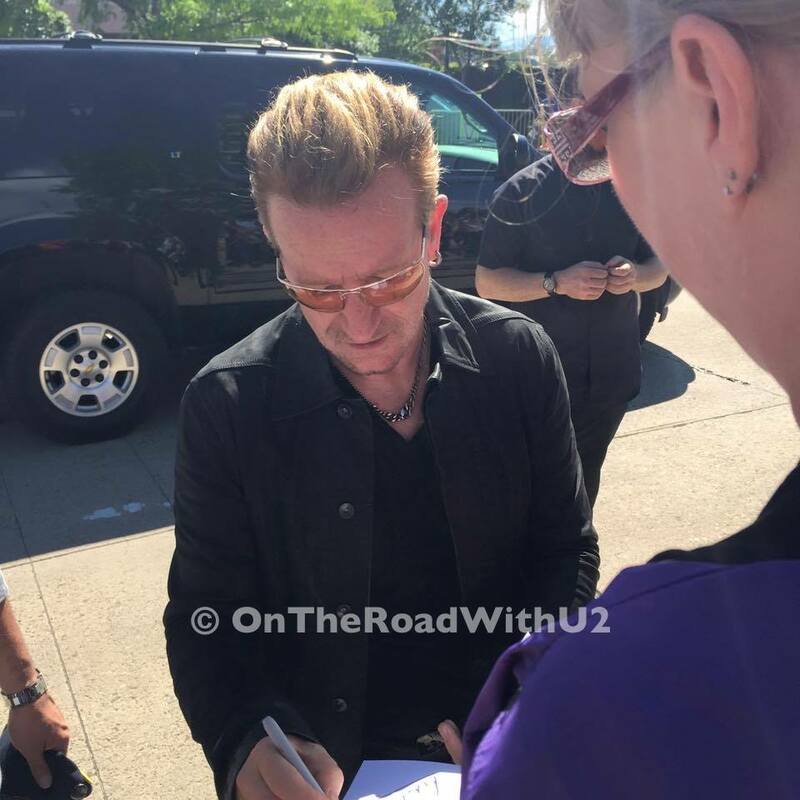 I have met and spoken with Bono a handful of times over the years, but this was only the second autograph I have gotten from him. The first time I met Bono was back in 1992 on ZooTv. 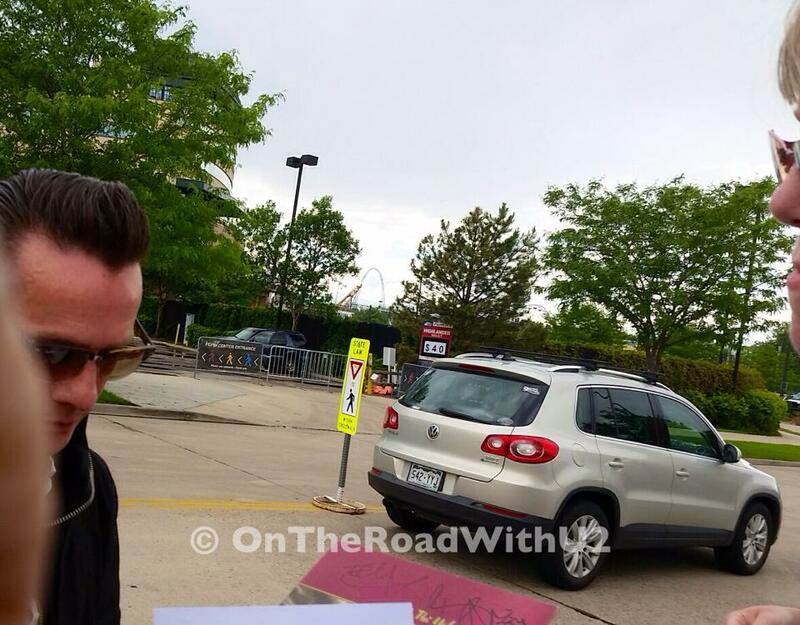 I got my picture with him and his autograph – he signed my Outside It’s America book. For the show that night, I walked into the Pepsi Center and straight over to the South Side, even though I was given a North Side wristband. 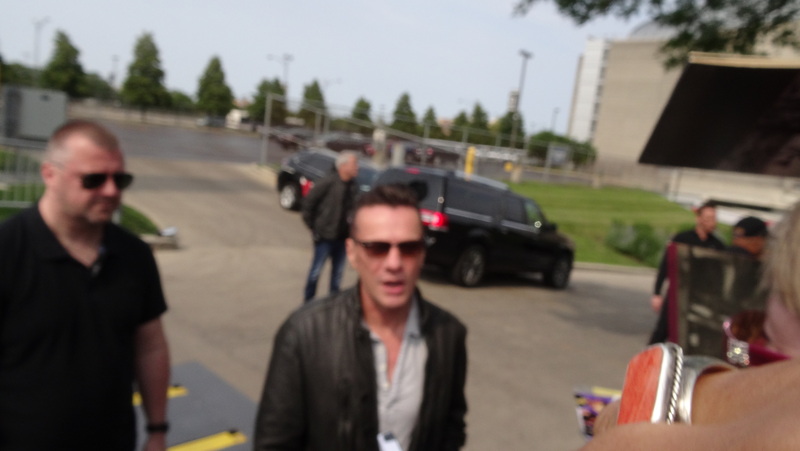 As I was walking in, Scotty (U2 head security) was walking in front of me. 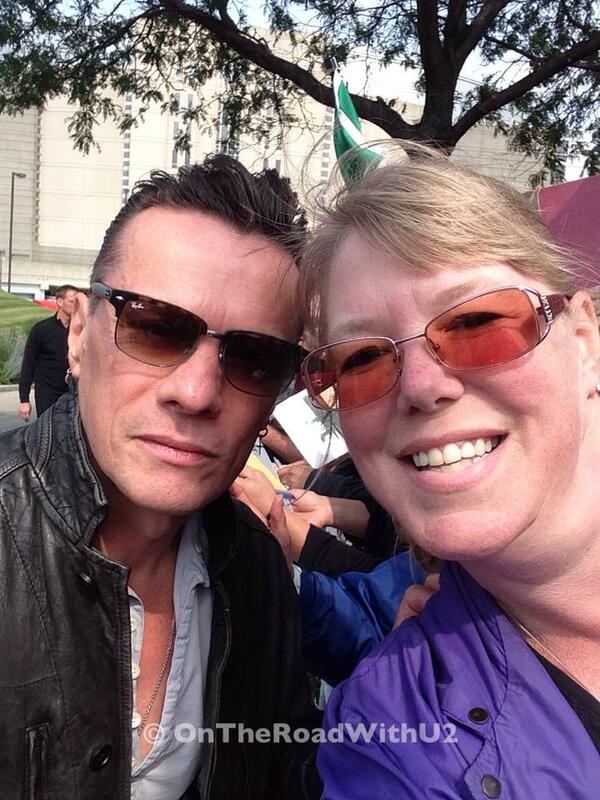 I thanked him for Larry coming out to greet the fans. I told him it was nice to meet Larry every 14 years, and he laughed. I went to the e stage and saw Jennifer, my old Elevation friend, on the rail pretty much in the exact spot I wanted to be so I stood right behind her and a shorter girl next to her. So I was pretty much on the e stage rail for Larry, although technically I was one person back. Our friend Tim, whom I met on 360 and saw a lot of shows with, joined us and stood with us for the show. My friend Mike showed up a bit later, but he moved around during the show. I was taking video of Larry playing the drums during “Angel of Harlem,” but stopped toward the end. I stood on my tip toes and was singing along of course looking at Larry, who saw me and smiled, winked and mouthed “Hi.” The song ended, I never took my eyes off of Larry (I rarely do anyway), Larry got up holding both his drumsticks in his hand, looked over at me and I could see in his eyes what was about to happen. I’m not sure what I did, I may have nodded, but I think I had a look on my face that said, “Yes please.” Larry locked eyes with me and walked directly over to me handing me his drumsticks before leaving the e stage. Apparently others were trying to get my drumsticks, but Tim was holding them back. 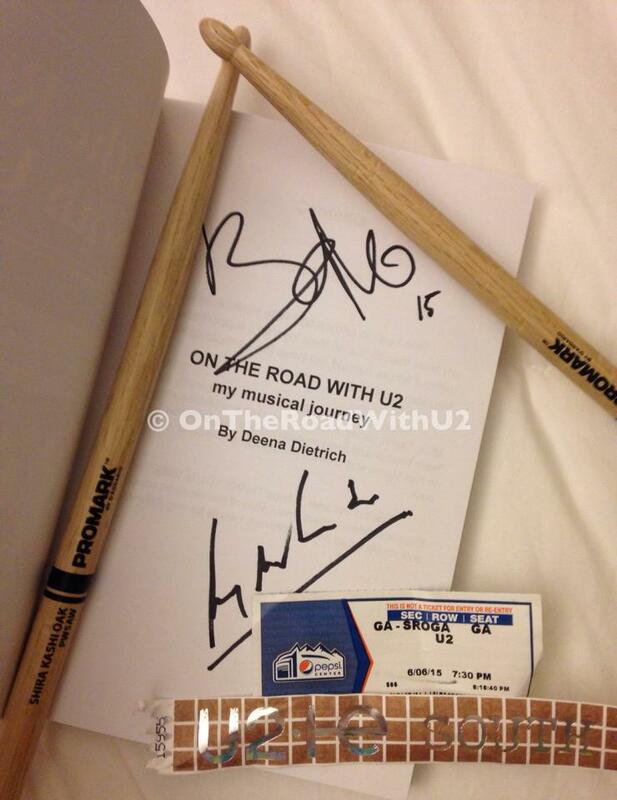 It’s not like it was random and Larry was just giving them out, he purposely gave his drumsticks to me. So I guess I didn’t make such a fool of myself that afternoon as I thought I did. Maybe Larry actually likes me just a little. I mean if my book doesn’t scare him off, nothing will. First thing I noticed as I hugged Larry’s drumsticks was that they didn’t have his name printed on them as they did on Elevation. Larry gave me one drumstick 14 years ago on Elevation in New Jersey, and Sammy (Larry’s drum tech) gave me one in Philly. But I had asked for those, and it was more random then. Larry walked over and gave one to me and the girl next to me. This night in Denver, it was unprovoked and I didn’t asked for anything. 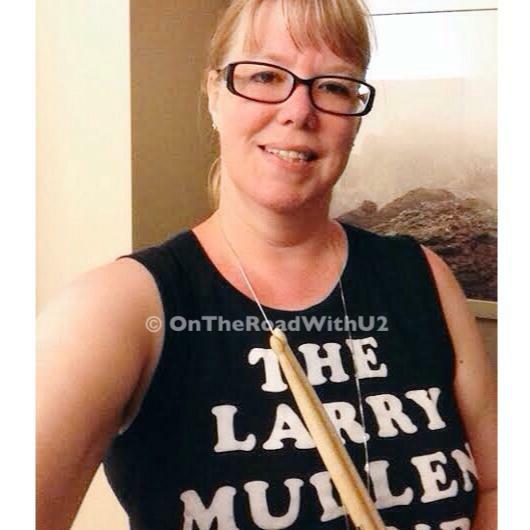 Larry saw me, walked over and put his drumsticks in my hand. That is my equivalent of getting on stage. “Angel of Harlem” will never be the same again! A month later in Chicago, I finally got my picture taken with Larry – after 23 years of touring it finally happened. 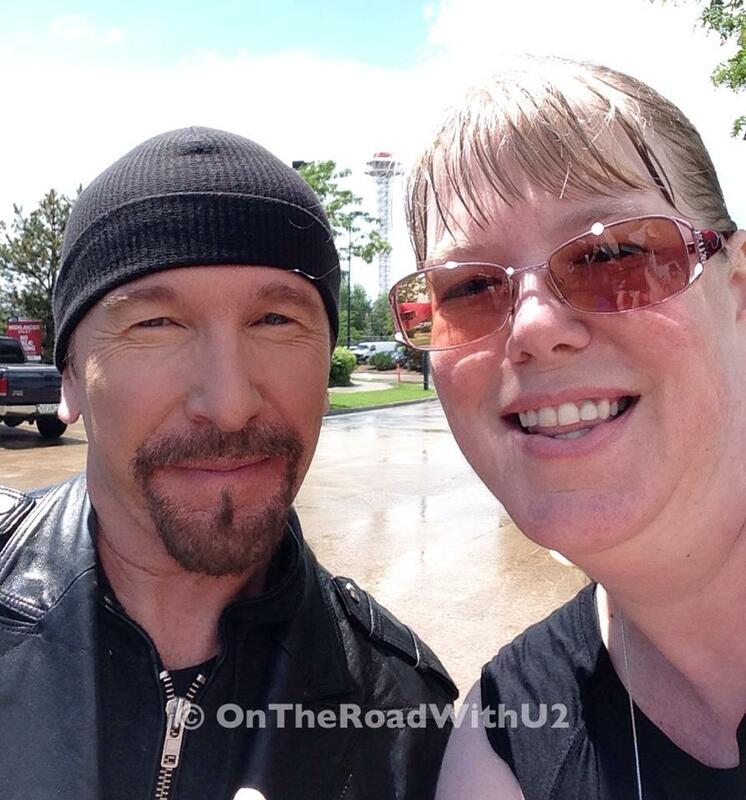 My second U2 goal realized. Rather than re-writing all my experiences from the tour, please click here for my review of the 15 iNNOCENCE + eXPERIENCE shows I saw in Vancouver, Denver, Chicago and New York City from May 14 through July 31 and travels and adventures along the way – not to mention the new amazing friends I made and the old ones I reconnected with. Thank you Vicky, Jenny, Anisha, Mike, Sharon, Autumn, Jennifer, Tim, Doug, Joy, Dahna, Ayaz, Kim, Mat, Melissa, Abbey, Marcela, Kevin, Jen, Chadd, Erin, Todd, Mel, Jeff, Marcy, Eleni, Lori and so many others who make this musical journey on the road with U2 so magnificent! 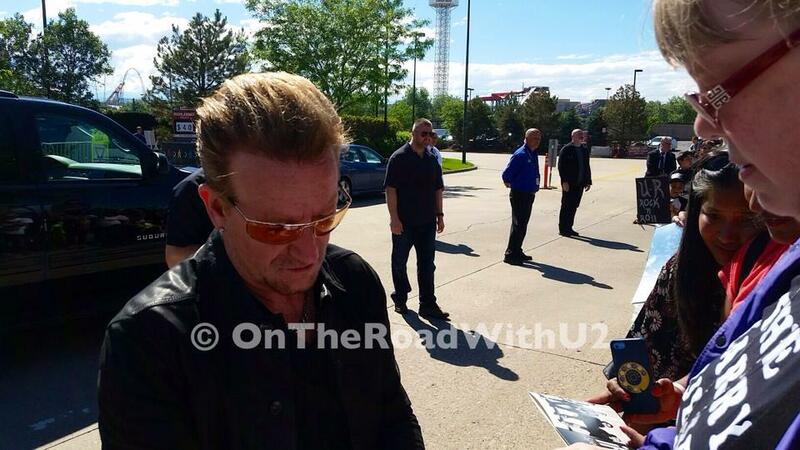 Click here to see highlights of photos from the U2ieTour. Thank you Vicky! I treasure our friendship! Amazing! 😀 I really must read your book! Thank you Lena! My book is $13 paperback and $7 kindle – it’s on amazon and the link is on my blog. Happy New Year!